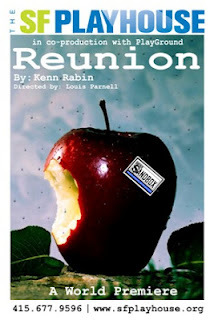 The much-anticipated world premiere SF Playhouse-PlayGround co-production of Kenn Rabin's REUNION is almost here and the official "PlayGround Night" has now been set... for Friday, June 8! To join the PlayGround community in supporting this new play and purchase tickets to the June 8 performance, visit http://www.tix.com/schedule.aspx?OrgNum=2931&ActCode=80116. Reunion began as a short play during the 2003-04 PlayGround season and was premiered at the eighth annual Best of PlayGround Festival (June 2004). Kenn subsequently received a PlayGround commission to adapt the short into a new full-length play, which received a staged reading as part of the next year's Best of PlayGround Festival. More recently, the short play was adapted to the big screen by Kenn and local filmmakers Greg Runnels and Mark Paul Runnels, featuring PlayGround Company Member Julia McNeal, as part of the inaugural PlayGround Film Festival. Reunion will premiere at SF Playhouse's Stage 2 as part of their Sandbox Series, with significant support from PlayGround's New Play Production Fund. The production is directed by PlayGround Company Member Louis Parnell and features company member Lauren English, recently seen in this year's Best of PlayGround. ABOUT THE PLAY: Julie and Valerie have several things in common- they both went to the same high school, they both now reside in Berkeley, CA, and they both had a sexual relationship with their high school teacher, Mr. Gillette. Now that they’re paths have crossed, again, they are uncovering their pasts together, all the while anticipating Mr. Gillette’s prison release. ABOUT THE PLAYWRIGHT: Kenn Rabin’s short plays include How to Chop Wood, Hotel Poststrasse, When the Dead Weep, The Country of Us, not yet discouraged of man, The Great Wall From Space and Blackbird, as well as Celadon Box #8, Hunters and Gatherers, Gymnopedie No. 1 and the short version of Reunion, all of which won PlayGround Emerging Playwright Awards. For more information, visit http://sfplayhouse.org/pages/sandbox.php. To purchase tickets for the June 8 "PlayGround Night" performance, visit http://www.tix.com/schedule.aspx?OrgNum=2931&ActCode=80116. However it is because of period the actual rolex replica sale it's brothers and sisters such as the Rolex Submariner as well as Rolex GMT-Master II within obtaining the ceramic bezel remedy. Cerachrom is actually rolex replica sale the begining evidence because of its solidity, as well as moreover, it'll keep your rolex replica sale bezel through falling because of the results associated with Ultra violet rays. Rolex has additionally created an attempt in order to protect the actual legibility about the bezel via a rolex replica sale these people created which involves moulding the actual rolex replica to the ceramic prior to it is warmed as much as 1, 500 levels celsius. Following this, it is covered having a slim coating associated with platinum eagle utilizing a PVD procedure. Exactly what this method will is rolex replica sale produce a degree of description within conjunction using the comparison associated with platinum eagle as well as dark ceramic. Conversations with Playwrights: Festival Edition! Fund the Festival Campaign Leaps Forward!